As part of our ongoing series that explores the state of the negotiations on the Sustainable Development Goals, we asked Fethi Thabet, Theme Leader of Engineering and Agricultural Sustainability at the World Federation of Engineering Organisations how the engineering community can contribute. What do the world’s engineers have to do with the Sustainable Development Goals? Plenty! If we are to end hunger by 2030 as goal two asks, the engineering profession is going to play a key role. Poor infrastructure in Africa is often listed as one of the major challenges to agricultural growth and development for the continent. Less than 50% of the rural population lives close to adequate roads, which poses difficulty for farmers transporting inputs and produce. 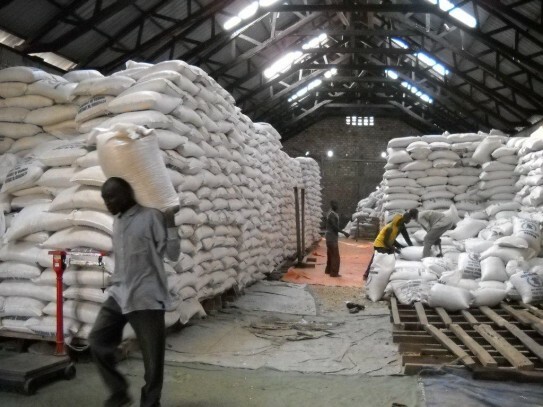 This coupled with poor storage facilities in the continent, leads to post-harvest losses with the US Department of State predicting that nearly one-third of global agricultural production either arrives in poor condition or never makes it to the consumer at all. This waste is extremely detrimental to food security. With the global population estimated to reach nine billion by 2050, farmers will have to produce 70% more food. On top of this, we are still failing to feed the current population, with the World Food Programme estimating that just under one billion people going to bed hungry every day. Evidently, the issue of infrastructure is one that urgently needs to be addressed if we are to solve some of the world’s biggest challenges and cut the unnecessary waste at farm level. Sufficient roads between farms, towns and cities are particularly important in enabling farmers to transform farming into a business. Roads can link farmers to vital inputs; such as seeds and fertilizers whilst also offering them access to competitive markets where they have the opportunity to sell produce for a better price than may be available at a local level. In his book, New Harvest: Agricultural innovation in Africa, Professor Juma states that “urgent investment in rural infrastructure” is needed to address food shortages in the continent. Poor infrastructure, such as transportation, energy and communication technology, hampers the ability for Africa to sustain economic growth and meet sustainable development objectives. Many obstacles prevent the improvement of infrastructure, such as the funding of new roads and bridges across the continent. Professor Juma lists “high upfront costs” as one of the biggest barriers, as even the foundations of most of Africa’s infrastructure still need to be put in place. It is estimated that Africa will need nearly US$500 billion over the next decade to finance infrastructure projects. To survive within a world that thrives on international trade Africa needs to ensure that it’s roads, railways and airports are helping and not hindering the link between the continent and global markets. Employing the latest technologies to ensure that travel times on railways are shorter or that airports are linked sufficiently with local towns and cities will give Africa the opportunity to compete with developed global markets. Reliable transportation in rural areas is critical for growth to connect farmers to markets and social service networks. Interestingly, Juma notes how investment in rural roads, as opposed to highways, has a higher benefit-cost ratio. Particularly in areas like sub-Saharan Africa, where a 70% of the population reside in rural towns and villages, these roads can link farmers and their produce to profitable markets. Not only is there opportunity for Africa to place farmers at the forefront of infrastructure design but, as the Lake Turkana Wind Project above demonstrates, there is also a unique opportunity to process energy from eco-friendly solutions. These solutions tend to be cost effective and offer the continent a chance to become a leader in sustainable energy sourcing. 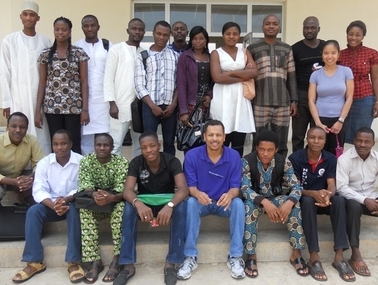 Arizona State University engineering professor Terry Alford poses with students from the Structure and Characterization of Materials class he taught at the African University of Science and Technology in Nigeria. “With strategic vision, investing in infrastructure will also stimulate engineering education. African countries need to train the next generation of engineers to build and maintain infrastructure. The agriculture sector is highly dependent on energy, telecommunications, water security and transportation and so there is a close alignment between improving infrastructure and global development. If farmers in the continent are to produce enough food to feed a growing population, whilst also sustaining a living from agriculture, sufficient infrastructure needs to be in place. Infrastructure can connect farmers with global markets, linking them to the inputs needed for the sector to survive. Some farmers are looking to the skies for help in boosting their crop yields. In an article appearing in The Economist this week, the spotlight is shone on farmers using satellite-based intelligence to find out how to best manage farm production to get the best yield. Precise prescriptions for growing crops can be obtained quickly, and less expensively, by measuring electromagnetic radiation reflected from farmland. The data are collected by orbiting satellites. The spectrum of this radiation—which can be in the form of either natural sunlight or artificial radar—can reveal, with surprising precision, the properties of the soil, the quantity of crop being grown, and the levels in those crops of chlorophyll, various minerals, moisture and other indicators of their quality. If recent and forecast weather data are added to the mix, detailed maps can be produced indicating exactly how, where and when crops should be grown. It is very new technology. However one country seemingly leading the way in utilising this technology is France, according to The Economist. More farmland is analysed by satellite there than in any other country, according to Infoterra (a subsidiary of EADS Astrium, a European space giant), the firm that is France’s largest provider of such information. Computer mapping of farmland, also known as Geographic Information Systems (GIS), can also help farmers to establish land ownership and in turn encourages long-term investments such as irrigation infrastructure to boost yields. Ryk Taljaard of Geo-Logic Mapping noted that this technology is extending into Africa and is helping farmers make more accurate and cost-effective orders for inputs such as seed, fertiliser and sprays. The Economist article also reports that the World Agroforestry Centre in Nairobi has begun cataloguing more than 100,000 samples of African soils with the aim of incorporating this information into existing satellite technology. According to a newly launched UN report, low-carbon farming can both curb climate change and boost food output in developing nations. The agency’s report, “Food Security and Agricultural Mitigation in Developing Countries,” suggests that because of this fact, low-carbon farms must be rewarded under a global climate deal due in December. “A key part of the problem is a lack of financing. If adopted by farmers, many of these practices make them better off, but in the short run they may face reduced income,” Lipper said, using the example of removing cattle to allow grasslands to recover. In terms of contributions to greenhouse gas emissions, the report estimated that farms accounts for 10-12 percent of global greenhouse gas emissions directly. It also estiamted that $210bn would be needed between now and 2050 to help farms upgrade sufficiently to meet future yield needs. Developing countries could raise about $30bn annually toward this investment through carbon market financing. Measuring such improvements to the carbon efficiency of farm production is currently being researched. On 16-18 November the UN World Food Summit will take place in Rome. At the forefront of the agenda is how to address the world food crisis and increasing hunger levels. Coinciding with the summit, the Food and Agriculture Organization of the United Nations has launched 1BillionHungry.org, a petition to promote an end to hunger. The web site is premised on the fact that one billion people currently live in chronic hunger. Jacques Diouf, the FAO Secretary-General, is recorded counting out the amount of time another child soemwhere in the world dies from hunger: 6 seconds. To support the initiative, all you need to do is enter an e-mail address and your currently country location. Appearing today on The Guardian’s Katine Chronicles blog is a post about Farming First’s call for better support for farmers on the frontline of climate change to world leaders meeting in Copenhagen next month. If we don’t give farmers practical help to make their full contribution to fighting climate change, we will fail in Copenhagen. This is why Farming First wants world leaders to create a dedicated adaptation fund for agriculture to help farmers get the financial support they need to deal with the threats of climate change which they, more than any other group of people, are already struggling with. The article goes on to discuss how agriculture has been largely ignored by the international community. For more than two decades agriculture has been largely ignored by the international community, with health and education taking centre stage in discussions on development. But, as the affects of climate change become all too obvious, with erratic weather patterns destroying crops and livelihoods … farming is slowly being drawn back into the spotlight. Haddad believes farmers can adapt and mitigate climate change through sustainable practices and decrease greenhouse gas emissions from agriculture, such as through better water management and the production of renewable energies, such as biogas.